On August 29, 2005, the nation watched as Hurricane Katrina ravaged the Gulf Coast, damaging or destroying over 120 schools in the New Orleans school district alone. In the close-knit community of Meraux, the hurricane destroyed the levees and unleashed a flood that buried their town in a watery toxic soup of marsh, mud, oil, and gas. The entire community was evacuated by any form of transportation available — boat, bus, pickup truck, helicopter — forced to wait until the waters receded to survey the extent of the destruction. What they found upon their return was unimaginable. Over half of the schools in the parish were destroyed beyond repair. Those that were still structurally sound had to be gutted and completely refurbished. In effect, the school system was gone. But, the people of Meraux were determined to come home. "I made a pledge to the community that for the first child who arrived back, I would provide educational services," said School Board Superintendent Doris Voitier. Thus began a whirlwind of rebirth and revitalization. Joseph J. Davies Elementary School was one of the schools that had to be completely razed and rebuilt. Despite a construction timeline that had to be condensed from eighteen months to an amazing nine months due to repopulation demands, the phoenix that arose from Katrina’s ashes garnered state, regional, and national construction excellence awards. This state-of-the art, technology-rich school is approximately 72,000 sq. ft. and consists of 44 classrooms, a computer room, a media center room, and an arts room. Amenities also include a performance stage and a large cafeteria with a fully accessorized kitchen. The structure consists of architectural block, brick veneer, structural steel, standing seam metal roof, interior gypsum boards, and acoustical ceilings. 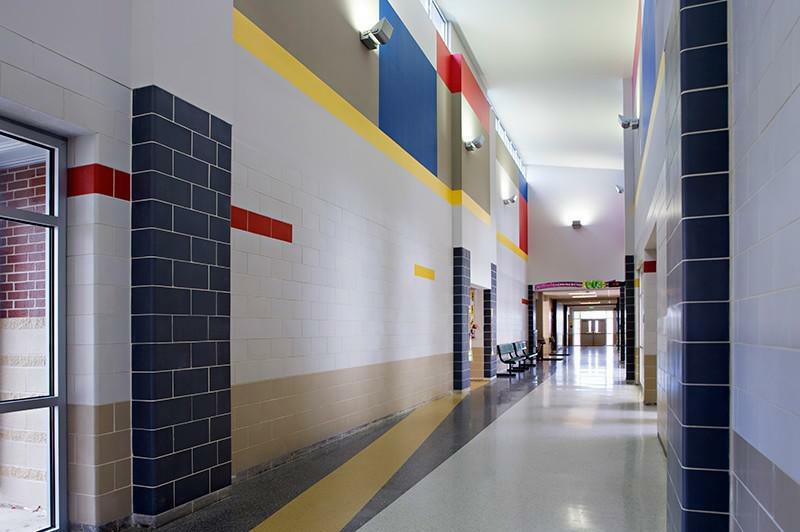 Over 80,000 Trenwyth® Astra-Glaze-SW+® units in seven different colors from the Echelon product line were used throughout the interior of the school to create a vibrant learning environment to match the spirit of the returning families of Meraux. The Trenwyth block, which is manufactured by Oldcastle APG, A CRH Company, is weather-resistant and rigorously tested for numerous environmental hazards, including acid rain, extreme temperature variations, fume exhaust, weathering, and more. They are manufactured with special additives to resist mold and moisture.